You are here: Up-daily » News » This Man Was Praised by Netizen After Doing This To His Grandmother, Must See! This Man Was Praised by Netizen After Doing This To His Grandmother, Must See! Mark Louie Carabbacan giving his Grandmother a bath. I was deeply touched by kindness and love of her Grandson, and I just have to leave it here. 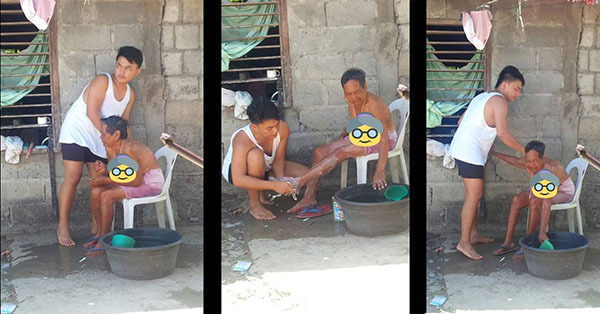 Grandmother's Grandson named Mark Louie Pabianes Carabbacan, posted on his facebook on how he manage to take good care of his Grandmother. He said that his Grandmother is now already weak, Now is time for his duty to bring back all good things his grandmother did to him. When his Grandmother taking a bath, He ensures that his Grandmother takes a lukewarm water. "She hates cold water." He said. "hindi ko alam kung hanggang kailan pa siya dito sa mundong ibabaw, habang binibigyan pa ko ng Panginoon ng pagkakataon na makasma siya, hindi ako magsasawang alagaan siya," He added. In the photo - captioned, Mark is proud to tell everybody that he will not get tired of taking care of his loving Grandmother. Netizens praised Mark on what he just did. This post became viral on facebook and other social media after it was posted. Total likes and shares still counting.